As the partners at River Run planned their Florida company’s future business back in 2014, they found themselves searching for new avenues to explore. “We have corn, we have cows, let’s try something different,” recalled Mike Casey, managing partner of River Run Olive Oil. Their interest was piqued by California’s burgeoning olive oil industry and wondered if producing olives in the Southeast United States might be possible. They asked Casey and his wife Connie to investigate. The Casey couple’s research led them on a journey across the country to explore operations in Georgia, California, Texas and Arizona. 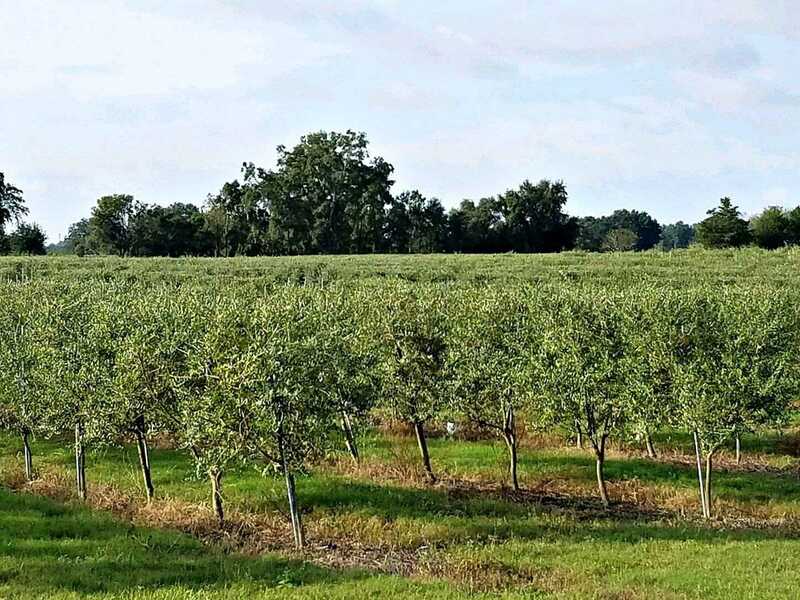 Based on their own independent research, they understood that Central Florida’s latitude was fortuitously situated for olive growing. After learning under the guidance of growers, they set out to determine more specifics on the conditions in their own areas. Casey conferred with various weather stations around the location for their proposed groves. He found that the area typically experiences 500-700 chill hours per year where the temperature sits at approximately 50°F (10°C) with relative consistency. This period would allow a window to put the trees into rest. “The stars were lining up,” Mike Casey said. Still, Connie wondered, “If you’re successful and you grow the trees, what the hell are you going to do with all the oil?” River Run Olive Oil was born. With Connie’s help, and the education they gleaned from consumers, growers, and chefs, the new company set a plan in motion to begin their own plantings. Casey continually emphasized the South East olive oil industry’s nascency, stating that it has only been in existence for roughly 6-7 years. For a crop that’s been grown for millennia, this is but a blip in time. “There’s a lot of varying degrees of knowledge,” he said, explaining what sources were most important in embarking on the ambitious project. He attributed a great deal of gratitude to growers in Georgia and Jennifer Gillett-Kaufman of the University of Florida (UF), and Louise Ferguson, a UF grad who served as an editor of the Olive Production Manual. Casey also cited Bruce Golino of the Santa Cruz olive tree nursery, Jim Etters of Seka Hills Olive Oil Co., Adam Englehardt of the American Olive Oil Producers Association and the team at Corto Olive Oil. He said that with the knowledge provided by these competent colleagues, he felt comfortable deciding to “throw caution to the wind” to a certain degree, rather than letting the available land sit idly by, unused. Casey also stressed the trial-and-error nature of the efforts required to build this new industry. Transportation of new trees proved an initially foreboding opponent, as propagation only takes place in the West. The team originally opted for smaller trees to save on transportation costs, but as Casey explains, “the smaller the tree, the higher the mortality rate.” New trees suffered at the hands of the long journey to Florida. The California people tried to explain it, but we were naïve and ignorant.” Some lessons are better learned through experience. He relayed the learning curve on mastering the variables of planting, moisture and herbicide. In perfecting their method, he noted that they did some herbicide damage on young, early trees. This experience taught the team that planting into sod, rather than untouched dirt, would help combat this “heavy weed pressure,” and that “once [they] got grass and turf established, the weeds were minimal.” Furthermore, “young and tender” grass also distracts insects from feasting on the olive trees. Even with these measures in place, ideal areas for planting changed with weather conditions. One year after planting their first trees, Hurricane Irma took the state by storm, causing the water tables to rise. This posed additional concerns to be accounted or. The new groves incorporate many of the latest technologies to aid in dealing with the myriad variables present in successfully running an olive operation. There is a weather station on each of River Run’s groves measuring for wind, moisture, and evaporation, and manipulating a computerized irrigation system based on conditions. There is one soil probe for every forty acres of trees. Based on projections from California, Casey estimates that each tree should yield 15-40 pounds of olives per year, a wide range accounting for relative uncertainty. The groves were predominantly planted in the super-high-density (SHD) fashion, though they do incorporate a European model for bigger, older trees at the entranceway to the farm. This allows researchers from UF an opportunity to compare the two models, and residents from the surrounding areas to potentially participate in a pick-your-own program in the future. Casey notes that the hardiness of olive trees means they are well built for such experimentation. Casey’s concerns predominantly lie with hosting his first harvest expected next year. When the time comes, he noted there will be no trouble finding facilities in the area to mill high-quality olive oil. He claims the South East region is “over-milled” and that there are “more mills than there are olives.” Many are nearby, from Ocala and Live Oak to Valdosta. They also host successful co-op plans and have pre-existing relationships with the company. Given the fact that they have invested so much money in their planting and growing operations, he currently does not have any intention to build a proprietary mill on River Run’s property. Someday they plan to penetrate the specialty market, with its growth potential in Florida’s metropolitan areas but, as Casey noted, “We have to get to the olive first.” His commitment to building a firm foundation for the rest of the South East industry to grow upon may prove to be an impact Casey has yet to realize.